Progress has been made on the baby quilts I have been working on this week. There has been a lot of quilting going on around here and some late nights. These baby quilts are now awaiting their binding. Aargh, not the binding. Once again I have encountered much indecision. But I will insist on finishing these this week. Triplets!! Can you even imagine?!? You move with the speed of lightning! 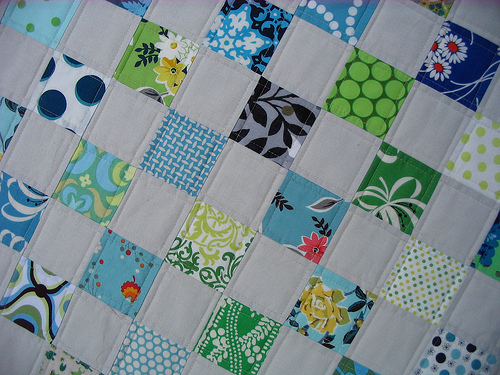 Will the quilts go in your Etsy shop! These 3 are simply gorgeous! Really, beautiful work! there adorable. I still can't beleive how you can do so many in a short time. Great job. I wish I COULD DO THEM LIKE YOU CAN. ugh...how in the world do you get EVERYTHING to match so nicely? it doesn't matter how much I trim and how careful I am. I'm jealous. If I lived by you I would make you come to my house and show me. Beautiful quilts!! Love the colors. Love & blessings from NC! These are really lovely! How on earth do you manage to get so much done?! My sisters are twins and they were more than enough... triplets would have sent my parents straight to the asylum lol! The quilts are so cute!! I love the baby quilts. How do you manage to do so much in the time? Your triplets are beautiful but if it means having real triplets - well you can just forget that one! What? My quilting guru having problems with tension? :) I have only FMQ one time so that is something that I am still working on...guess that is something that we are always working on! They are just great! Tension sometimes is one of those thing that is difficult to figure out. Upper, lower.... I feel your pain. Only the worse than tension on the sewing machine, is tension adjustments on a serger (more threads). I can only figure it out by looking at picture in manual and then pulling the top thread to determine if I've made it tighter or more loose... the know does nothing for me either. The quilts look great! Beautiful quilts. And as a mom of twins, I couldn't even imagine triplets! Oh my, twins maybe, but triplets I'm not sure I would survive! I love your stuff! so cute... but i would expect nothing less from you! I am useless when it comes to figuring out tension too. 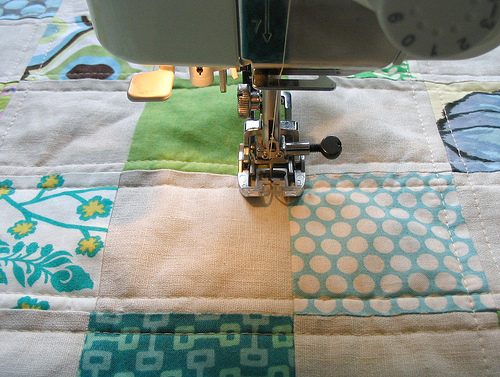 Funny that you had problems with straight-line quilting, that's usually the safest. Love these quilts. What color is the solid square? Looks like a pretty grey in the photo. These are so wonderful! I love the way in which you quilted them! I really admire your work! For as perfect as your stitches always are on each and every quilt you make, I would have thought you'd use a walking foot. I was surprised when I saw the regular foot on your machine, or are my eyes deceiving me?. I'm a new follower of your blog and will now go check out your etsy shop.